Centre College is located in nearby Danville, just nine miles from Beaumont Inn. Founded in 1819, Centre College is a U.S. News top-50 national liberal arts college (Kentucky’s highest nationally ranked institution). Centre’s promise to its students is “personal education, extraordinary success.” The College delivers on this pledge with one-to-one from day one career preparation; small classes taught exclusively by challenging, dedicated professors; and an all-learning, all-the-time campus environment that provides abundant opportunities for social interaction and leadership development. Norton Center for the Arts is the arts facility of Centre College. Widely recognized as one of Kentucky’s most important cultural resources, it offers exceptional programming in the performing and visual arts for the students, faculty, and staff of the College and for residents and visitors to the region. All Norton Center events are open to the public. Check out the amazing line-up at the Norton Center for the Arts! Centre College received its charter from the Kentucky Legislature on January 21, 1819. Classes began in the fall of 1820 in the first building of the College, Old Centre, with a faculty of two and a student body of five. Since that time Centre has remained steadfast in its mission of providing superior education in the liberal arts tradition. For more about them, go to the Centre College Web site. 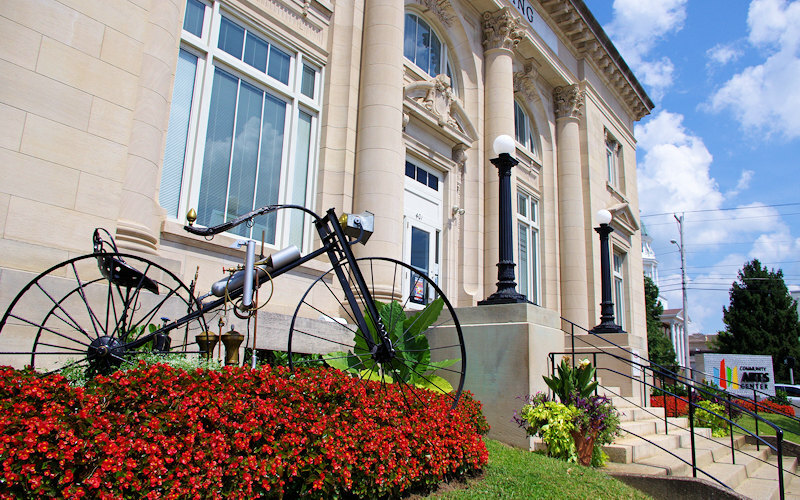 There is much to see and do in Danville! Known as the “Birthplace of the Bluegrass,” see its stately homes and beautiful tree-lined streets. Constitution Square State Historic Site, 134 Second Street is a wonderful reproduction of a pioneer square which includes a meeting house, courthouse, jail, and the original post office. The early Fisher’s Row homes house a museum and art gallery. Across the street is the Ephraim McDowell House and Apothecary Shop. Dr. McDowell preformed the first successful removal of an ovarian tumor in 1809. Burke’s Bakery has delicious cakes, cookies, sandwiches. The Community Art Center also on Main Street has several exhibits and displays of local art. There are several neat shops in downtown. Great American Doll Museum is located at 334 Swope Dr. The 6,000 square foot museum that contains 200 dollhouses and thousands of related miniatures, presented in remarkable detail. Another interesting place in Danville is the Chateau du Vieux Corbiau at Old Crow Inn. The wonderful building which dates back to 1780 is surrounded by the vineyard complete with tasting room and gift shop. 471 Stanford Road.